Quartz is a beautiful material that is made up of ground quartz stone, pigments, and resin that many homeowners select for the countertops in their home. It comes in a wide variety of colors and veining and is extremely durable. While this material is hardwearing, it is not indestructible and does require some maintenance. 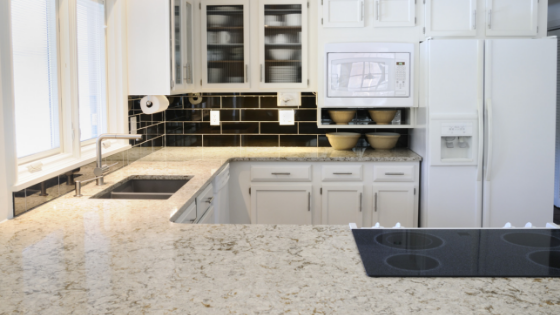 Here are a few important things to remember when caring for your quartz countertops. Some common household cleaners contain chemicals that can actually loosen the bonds between the resins, polymers, and mineral pieces that are used to make quartz. It is best to use a cleaning product that is made specifically for quartz to ensure it does not have those harmful chemicals. Your local big box store is likely to carry cleaners and polishes safe for your quartz counters. Or for an even safer, more natural cleanse, use a gentle dish soap and warm water. Unlike other countertop materials, quartz is not porous and is made to not require being sealed. The factory finish will last for years and years with proper care and frequent cleanings. Your quartz counters probably came with a manufacturer’s warranty, like many other engineered construction materials. Hang on to this warranty certificate as long as it is “good.” In rare cases, quartz counters can break away, crack, chip, or become damaged. The warranty certificate will be helpful in those rare and unlikely cases and will outline any necessary steps you should take. Products like steel wool pads should not be used to clean your quartz counters. Quartz counters are loved for how solid and durable they are, but the beautiful polished surface can become dull or scratched when things like steel wool pads are used. Instead, use a sponge, soft bristled brush, or microfiber cloth for all of your cleaning needs. For more difficult clean ups, like dried on food or other spills, use a plastic putty knife to gently scrape off the mess. Avoid using super sharp objects, like knifes or other metals, as this can scratch the surface of your counters. Yes, quartz is a hard material, but it is not hard enough to withstand some scrapes from a sharp knife. The beauty of quartz counters is that they were made to be low maintenance. They are nonporous and stain resistant, scratch resistant, and won’t easily crack or chip. Quartz has a very strong finish and is unlikely to discolor or fade. As previously mentioned, there is no need to seal or reseal over the years. Just sit back and enjoy your beautiful investment. For more information on quartz counters and why they may be right fit for your home, contact Granite 4 Less for a free estimate today. Our expert staff members are available to help you find what your dream home looks like at a great price.